In a Rush? 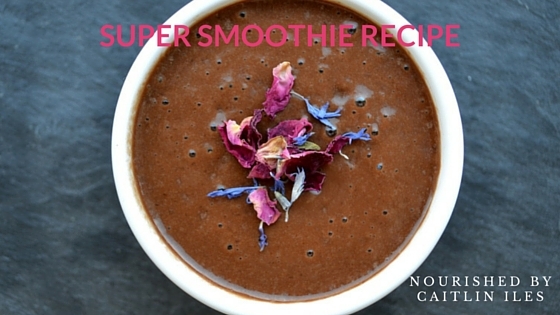 Enter the Super Smoothie! Sometimes I just don’t have the time (or don’t want) to whip up a full meal, but I don’t want to succumb to the siren’s song of packaged snacks. In these cases I usually grab a jar of some sort of meat I’ve prepared in advance (today it’s brisket) and whip myself up a smoothie. This guy is full of awesome nutrients and though I’ve added a few items, which may be difficult to source, such as the Dandy Blend or Irish Moss, I can assure you it tastes just as good without these extravagances. You know me, the bigger (the nutritional punch) the better! So here’s my recipe. It makes about two servings depending on how hungry you are. I enjoy mine in a glass jar, or measuring cup if all my jars are in use, with a glass straw. Combine everything in a blender and whip until smooth. Add water until it reaches the desired consistency. I like to keep mine fairly thick, but it’s all about personal preference! Pour and serve! Can store the second portion in a mason jar in the fridge for a day or two. For an extra punch, feel free to add some greens such as kale, spinach, or Swiss chard. There is definitely enough sweetness to mask the bitterness of these nutrient powerhouses. Conversely, if you have a greens powder you trust completely (that means no artificial colours, flavours, or preservatives), throw a Tbsp. or two of that in there. If you can find a good brand of protein powder that doesn’t contain a list of ingredients as long as your arm and that isn’t loaded with artificial sweeteners feel free to add it to have a complete meal in a jar. I don’t usually use protein powders since I just grab some sort of meat for the side, but if you’re in a crunch powdered protein is better than no protein. Adding strawberries is also delicious. They’re just not in season right meow so they’re super expensive and anemic looking. If you can find a coconut or almond milk yogurt, which again isn’t loaded with scary sounding ingredients add a couple Tbsp. in for creaminess. You can also substitute the coconut milk for another type of nut milk. Almond and hazelnut milks are delicious! Just be sure that if you’re not making your own that they don’t contain artificial colours or ingredients, and that there is no carrageenan. Man do I ever love me some avocado! It’s one of the few things I’ll buy out of season just because they are so amazing in absolutely every way. I’ll eat them plain with a little sea salt, make a delicious guac, squish them together with some eggs and hot sauce, and slice them into salads. There is really no limit to what you can do with an avocado. A friend of mine was a little skeptical about adding them to a smoothie, but what with all the other flavours going on, the avocado really just adds a great lusciousness and creaminess. If you’re also skeptical, try adding a ¼ of one to start with and see how you like it. You can always add more or less next time depending on preference. Anyway, I’ve included them because they’re an amazing source of monounsaturated fat (the same stuff found in olive oil), which everyone in the health food world freaks out about due to its cardioprotective benefits. Avocados also contain potassium, which is the lifelong partner of sodium and helps regulate our blood pressure. Next we’ve got some awesome fibre to help move along our digestive process and trap and eliminate toxins from the body. There are tons more fabulous benefits to including avocados in your diet, but I don’t want to overwhelm you with awesome right out of the gate. Coconuts are a great source of medium chain triglycerides, which are a type of saturated fat that is quickly absorbed and preferentially used by the body as an energy source, especially by your liver. Eating coconut in all its various forms is a great way to eat fat to burn fat, ensuring your booty never gets too bountiful. Raw cacao contains very little caffeine when compared to roasted cocoa, which is great for those of us trying to limit our consumption. It also has a crazy high ORAC (oxygen radical absorbance capacity) score, blowing away the number 2 spot by almost 12 000 points. This score measures the antioxidant activity of specific foods in living samples (people or animals). Remember, we want lots of antioxidants to help keep us looking young, fresh, and fabulous! These guys are responsible for sweetening our smoothies. These delicious little balls of amazing are super rich in antioxidants. Their nutrients are part of the family called anthocyanidins, which give the berries their bright blue colour. They’re also high in vitamin C, resveratrol (the antioxidant in red wine which people the world over use as an excuse to indulge, not that I think that’s a bad thing. Life is all about balance folks! ), and ellagic acid. All of these compounds function together in your body to help fight oxidative damage caused by evil free radicals. Sidebar: Free radicals are atoms, molecules, or ions with unpaired electrons. Since these electrons are lonely and searching for “the one” they roam around your body either looking to steal an electron or lose an electron. This makes them very volatile and enables them to change the form or function of cells in your body. Enter Super Antioxidants, who ever so nobly donate an electron to the free radical, making him happy and whole in his new relationship, without actually becoming free radicals themselves. I love these little berries. They’re high in antioxidants; amino acids, which are the building blocks for protein and other substances in the body; and vitamin C. Including these dried berries in your diet will help boost immunity thanks to their vitamin C and antioxidant affect. 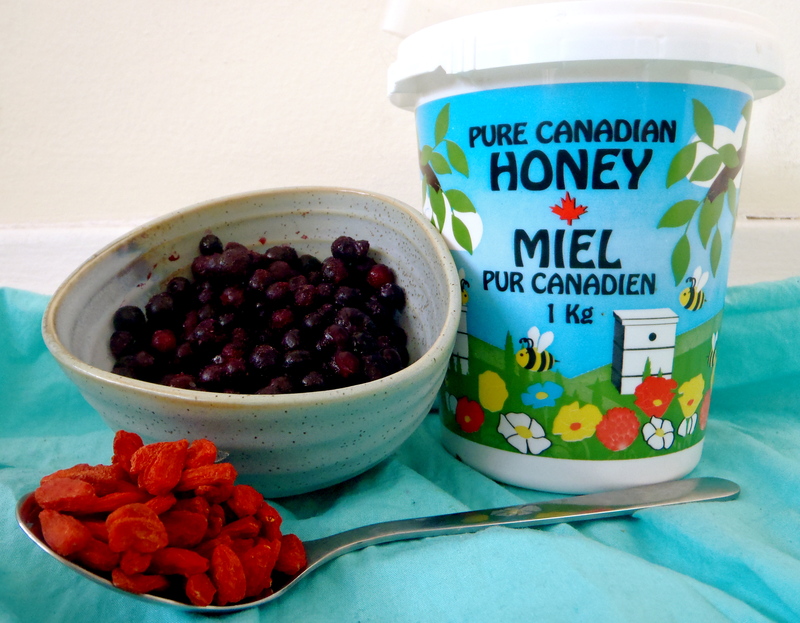 They have a somewhat sweet and sour taste too, so they add a nice flavour to salads, smoothies, or homemade trail mixes. Nutritional content of nut butters will vary depending on which you choose, but most are healthy sources of fats, some protein, and some fibre which help balance your blood sugar. Again, you don’t want to go crazy with nut butters because some can be high in omega-6 fats, which when eaten out of balance with omega-3 fats can promote inflammation in the body. This is typically only a worry if you’re eating a diet high in processed and refined foods, which usually use canola oil (boo!) as their main fat source. Refined seed oils (canola, corn, peanut, safflower) should definitely be avoided if your goal is health and happiness. Here we have some irish moss before it’s been boiled and pureed. It makes a great emulsifier and thickening agent in recipes! This seaweed is powerfood that my cooking prof, Meghan Telpner, introduced to me. It comes from the sea and so contains tons of essential minerals, such as iodine. Iodine is necessary for proper thyroid function and for preventing the growth of those scary looking goiters. If you live around me in Ontario, we live in the so-called goiter belt because our soil is so iodine deficient. As such, it’s important to incorporate seafood and sea veggies in our diets to ensure adequate intake. It is also a great source of soluble fibre, which is the type of fibre we want most in our diets. This fibre helps propel waste along our digestive tracts and makes it easier to absorb and eliminate toxins from the body. 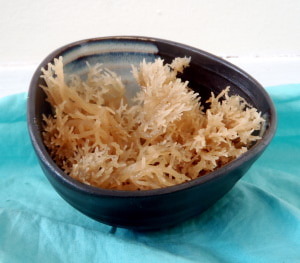 Preparing Irish moss for consumption is also super easy. Rinse it through several times under running water until all the sand is gone. Then throw it in a pot, cover with water and boil until squidgy and starting to gel. Once softened, remove from heat and blend until smooth. You can store this stuff in the fridge almost indefinitely. Don’t be afraid if it starts to smell like the ocean; it hasn’t gone bad! This item is another addition to my pantry thanks to Meghan. It’s a great replacement for coffee and contains roasted dandelion and chicory root extracts. Unlike coffee, which creates an acidic environment in the body and is loaded with caffeine, Dandy Blend has a supportive effect on the liver thanks to the dandelion root and it tastes just unbelievable. You can use it as a replacement for coffee in recipes or drink it plain with hot water. It gives this recipe a slightly richer taste, and even folks who dislike coffee (like me!) will likely enjoy its addition. So there we go friends, a healthy, creamy, amazingly delightful smoothie for when we’re on the go or just feeling a little lazy. What kinds of smoothies do you make? Let me know in the comments! And as always, happy eating! PS: The kombucha turned out amazingly delicious and I’ve already drunk 2 litres in the past two days. I’m keeping track of how I feel and look for the next 30 days to see if it lives up to any of its health claims. I’ve not changed anything else about my diet or lifestyle except the kombucha, so it’s about as controlled as an n=1 experiment can be. Stay tuned!